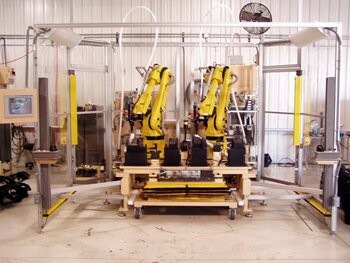 Robotic Fastening Automation Solutions - Flexible Automation Inc. Flexible Automation has been building robotic systems for over 35 years. We have extensive knowledge in a wide array of industries. 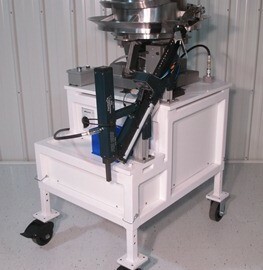 We have worked with a wide range of machines serving a variety of application types. Our systems have been designed to allow for semi-custom solutions while ensuring the integrity of the entire system. This gives the ability to adapt it to fit your needs from size to brand and everything in between. Robotic insertion and setting of captive type fasteners on trim panels, instrument panels (IP), front and rear bumper beams, front-end modules, white-good appliance enclosures, sunroofs, heat shields, and under-body panels, etc. SREN MX (robot end-of-arm tool) by Flexible Automation, Inc.
SREN HX operator-guided gun by Flexible Automation, Inc.
Robotically join product components such as under-body panels, white-good appliance enclosures, heat-shields and insulation material. Robotic integration of screwdrivers, nut-runners, and special spindle-driven tools for the assembly of heat shields, enclosures, aero-panels, white-good appliances, actuators, motors, infotainment modules, sensors, etc. Platen Assemblies by Design Tool Inc.
Robotic placement of die-cut pads for control of vibration and heat for LED lighting, panels, control modules (ECU), displays, wireless devices, sensors, etc.